On a boat in the cooler weather, it’s nice to have some kind of heater for warming up the cabin. There are quite a number of ways to achieve this, from stoves that burn diesel, to charcoal, to tea lights, among others. And there are safety considerations, also worth discussing. Following is a rundown of a number of those boat-heater choices, along with my experiences with some of them. When I sailed the Falmouth cutter, NEW SALT, it had a marvelous Dickinson diesel stove. It was a cook stove with a cast iron top and an oven, and a slow drip diesel firebox on one side; the whole business fit right into the spot where people often put a propane stove on a Falmouth cutter. You could cook on this stove, but that only made sense when the weather was cool, because it threw a lot of heat, which it was after all supposed to do. The boat had a 3 gallon diesel “day tank” installed high on one side of the stern locker in the cockpit, with a fuel line run forward to the stove. When I got the boat there was no fuel pump, but the stove didn’t run well at all. Studying the manual, there wasn’t enough “head” from the fuel tank, and the manual suggested that if raising the fuel tank wasn’t practical (which it wasn’t) then a pump would be necessary. I wasn’t too happy about this, but wanted to be warm! In the end, the small 12 V pump was fine, with infinitesimal draw on the battery. It made a clicking sound as it worked, which increased in frequency from every several seconds to quite a bit more often as the stove started burning more enthusiastically. As it turned out, the pump noise was great, because it let you know how the fire was doing without having to go open things up and actually look. The fuel use was tiny – I think that I only refilled that tank once, sailing spring and fall up to Maine and back for two years. Being cast iron, the stove held lots of heat for quite a while after the fire was put out. I’m going into this in such detail because I’ve been reading an interesting blog lately, http://www.artofhookie.org done by a man who’s been living aboard a Falmouth cutter, and he’s been writing about being very cold! Since heaters have been on my mind anyway, it seemed like a good time to write about them. On the Chebacco, AUKLET, I considered a diesel heater, but in the end my priorities were smallest size and least smell, which took available diesels out of the running. Light weight figured into the wish list also. The heater with the smallest footprint turned out to be one that burns lump charcoal – not briquettes, but the stuff that people use for fancy barbecuing, that is made of actual chunks of wood turned into charcoal. When burning well there is no smoke at all, and it uses a very small diameter stovepipe. There is a company in England called Bengco that fabricates these from stainless steel sheet, and it seemed worth the fuss, and the expense, to get ahold of one. With this stove, in addition to the narrow stovepipe on the inside of the boat there is a special fitting that goes in the cabin top. The interior stovepipe connects to this fitting, and then on the outside there is a removable cap. When you’re going to make a fire you take off the cap and replace it with a short section of exterior stovepipe. Underway, the cap is back in place, lower than the boom and keeping out all water. For starting the fire, Bengco makes a fancy wick holder that’s built into the removable ash pan on the bottom of the stove, and they suggest that once you’ve put charcoal into the hopper, you get the charcoal burning by putting alcohol in the wick, lighting it, and replacing the ash pan, so the alcohol flame comes up through the grate under the charcoal. It seemed like it was going to be hard to do this as a regular thing, especially with the stove mounted low the way it is in AUKLET. And I wasn’t wild about the alcohol, both burning and not. Instead, we decided to try long-burning firestarters, or a variation on that idea. The firestarters that you can buy are pretty smelly, mainly because the reason they work is that they’re made of wood with a lot of pitch in it. But a lot of years ago, when I used to heat with wood stoves all the time, a friend told me about a recipe for homemade firestarters: cardboard egg container, with all the little cups for the eggs, lint from the clothes dryer, and melted paraffin wax. Pack the lint into the little cups, pour in the melted paraffin (in the US, “paraffin” means hard wax, like for making candles or sealing the tops of home canned jelly jars – I’m NOT talking about pouring what we would call liquid kerosene into the egg cups!) After the wax hardens, you cut the egg container so you have separate lint/wax-filled cups, and when you want a fire you light one with a match or a lighter, and put it into the materials that will become your fire. It turns out that one of these lint and wax balls works great for lighting charcoal. The only thing we changed was that we added a cotton string about 6 inches long, placing it in the cup along with the lint before pouring the wax. This is not a wick – rather, it’s a handle. Charcoal goes in the stove; firestarter goes in the hopper while still holding the string; long lighter, like for barbecue grills, is used to light the firestarter; and once lit, the whole business is dropped down onto the charcoal and the hopper is closed. The string burns away along with the firestarter, and most of the smoke from the whole process goes up the stovepipe. It has worked really well. People complain about the bulkiness of fuel for solid fuel stoves, but that’s another reason that I’ve liked charcoal. It’s compact compared to wood, for the amount of heat produced, and not terribly heavy for its bulk. We’ve been getting the 7 pound bags and then repackaging them in gallon Ziplocs, which makes things less messy and easier to manage, as well as keeping the charcoal dry. A hard-to-reach locker is mostly dedicated to charcoal storage, with a couple weeks worth (about a half a bag a day, or less, when it’s chilly but not seriously cold – more when it’s colder) kept where it’s easier to get at, which has worked out fine. It’s not a smelly liquid that could spill, nor a gas that could explode, a characteristic that I’ve found very relaxing. This stove has worked, in general, quite well. It has a well done vent on the front side of the bottom ash pan, with a threaded cover, so the airflow can be completely controlled. The hopper has a gasket, and the theory is that it’s an airtight stove that can be turned very low and will hold a fire overnight. In practice, those gaskets are fragile. The photo above shows tinfoil being a temporary gasket section, but this year I have learned better. After replacing the broken gasket last winter with a new one from the manufacturer, even with careful attention I broke the new one pretty early on in this trip. This time I decided to try using the stove without the gasket at all, and it actually works pretty well. I made another tinfoil piece that goes over most of the top and the upper front of the stove, easily removable and covering the face of the hopper. It’s not a gasket; rather, it slows down any airflow that makes it past the ungasketed but fairly tight hopper door. It’s been satisfactory, and is easier to do than another gasket replacement. With the tinfoil cover on and the lower vent completely closed the fire will go out entirely, saving charcoal for next time. The glue-on gaskets that you get in the hardware store could be worth a try also, but I haven’t wanted to mess with the process of the glue burning in. This stove is also useful for heating water, and food. I have a tiny teakettle for heating water, and a 7 inch diameter pot that will also perch on the top of the stove. There’s a propane camp stove on the boat for when the weather is warm, but the charcoal stove does a great job whenever the temperature is cold enough for wanting heat. Nowadays, I have rather wished that I had put in this other version of charcoal stove: http://rwrope.com/davey/stoves-and-stove-fittings/davey-company-hot-pot-stove.html (nope, not receiving anything.) I considered but rejected this stove originally both because of weight and because of its somewhat larger size. Also, it needs a larger diameter stovepipe. But that larger stovepipe seems more doable now, and the trade-off for all of these issues is a stove that can burn several different fuels, including charcoal, wood, and real coal. It might be worth a look, if somebody is considering the possibilities. There are other, lower tech options too, especially in very small boats. Candle lanterns – the kind that include three candles, like this: http://www.campmor.com/outdoor/gear/Product___80350 – throw a surprising amount of heat along with their light, and don’t spill when the boat rolls. I used two of those in the Falmouth cutter, but I’m not good with the gases from burning candles, and ended up with a pretty intense ongoing cough until I figured out that the candles were actually the problem. I considered making a vented “candle lantern box” for AUKLET, but decided that the charcoal system was easier. Still, it can be done! I was intrigued with the idea of a double vent system – intake and exhaust, one inside the other, made from flexible truck exhaust pipe – maybe one of these days. Now there’s a whole series of stuff on the Internet about using tea lights and inverted, nested clay flowerpots. This is cheaper than the candelier lantern above, both originally and for ongoing candle supplies. And I think that the flowerpot system would be more effective for feeling warm because of the radiant heat from the terracotta, in addition to the overall space heating that candles do. The flowerpot folks talk about getting tea lights by the hundred, at very low cost, and that they burn for four hours each. This still doesn’t solve the problem of combustion gases, but with a little thought one could work this out. I especially liked this video: http://www.youtube.com/watch?v=nzKbFzUEWkA because the nested flowerpots are both held with a bolt. But it would still need more work in order to be safely restrained on a boat. Another alternative that is used by quite a few boaters is to simply put an inverted clay flowerpot over the burner on the propane or alcohol cookstove, held in place, and therefore quite stable, with the usual potholder for cooking. I think that this is probably effective for heating because, like the tea light system, it is changing a good bit of the heat from convective to radiant, so you feel warmer for the same amount of minimal fuel use. But you still have to watch out for carbon monoxide, and oxygen depletion, when running the stove for so long. In NEW SALT, I originally thought that “adequate ventilation” was achieved by cracking the sliding hatch two or 3 inches, so this is what I did when I was running the diesel stove. At the time I was also using a kerosene lantern for light, and one evening the flame kept getting lower. I kept turning up the wick, and much too soon, the flame would get lower again. I finally put together the information in front of me and tried letting in a bunch of fresh air, whereupon the flame shot right up, now having way too much extra wick. That was a sobering experience, and from then on if the diesel stove was running I left one of the three drop boards out of the companionway. That was enough that there was never another problem with the lamp flame. Another safety consideration is heat shielding. In the photo above, if I was doing it again I would extend the back heat shield further to the left – that bulkhead can get overly warm. Regular aluminum foil works well for temporary heat shields, and when the stove is running nowadays I put a piece of foil in front of the tool bag and water storage that are somewhat near the stove, also to port. On NEW SALT, tinfoil was good behind the stovepipe, where there was a hotspot when the stove ran for quite a while. Then it was easy to remove the foil when the stove wasn’t running, and have easier access to the storage space back there. Heat shielding is incredibly important – and fortunately, it’s also easy! All in all, I still sort of miss the diesel stove, but I don’t miss the smell of burning diesel coming out the stovepipe, and anyway the diesel stove was never going to fit aboard AUKLET. The charcoal stove has been a good alternative. When the weather is cold in the spring, and again in the fall, whatever stove that’s on the boat is my very best friend! Just discovered your blog, and am enjoying it and learning a lot. 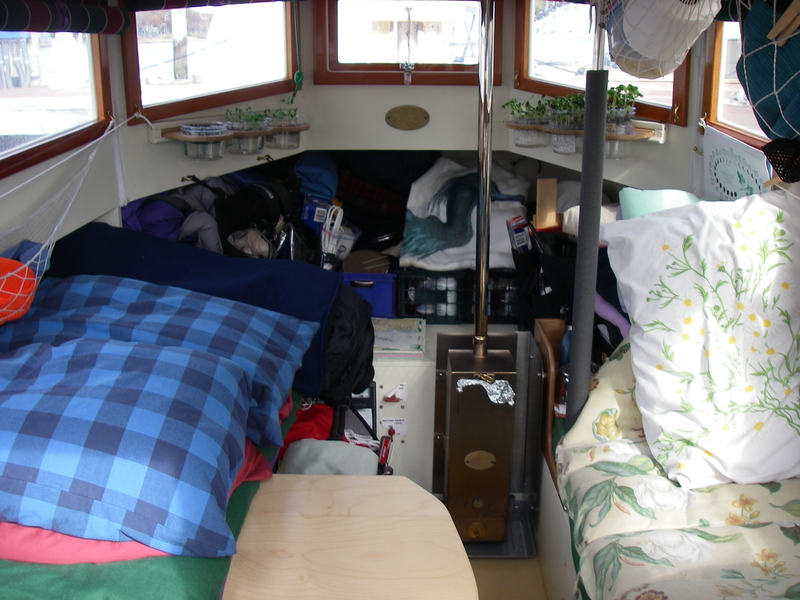 Regarding stoves, Fatsco stoves work well on a small boat. Instructions say charcoal or briquettes only, but I’ve had good success with charwood and (free renewable) trimmings from a peartree. Glad you’ve been enjoying reading the stuff here! Very interesting about the Fatsco stoves. I found the company website (here, for anybody who’s interested: http://www.fatscostoves.com/ ). I think that the man who sewed the new sails for AUKLET said he had one of those in his catboat, but he had thought they were out of business. It’s great to see them still going! I’m looking forward to poking around and finding some photographs, besides the ones in the brochure. Thanks so much for your kind words – and for writing!